Only a few weeks after launching the KN55S9 55" curved OLED TV in South Korea for 15 million Won (about $13,000), Samsung slashed the price today by 34% - to 9.9 million Won (about $8,900). Samsung said that this price cut will enable them to reach more consumers and lead the OLED TV market. Samsung will refund the difference for customers who already bought the TV. Reports from Korea say that Samsung were also able to improve the production yield of these OLED TVs and so can now produce more panels and lower the price. Now it will be interesting to see how LG responds - their own curved OLED TV costs $13,000. LG is using a theoretically more cost-effective production technology (WRGB vs Samsung's direct-emission OLEDs). 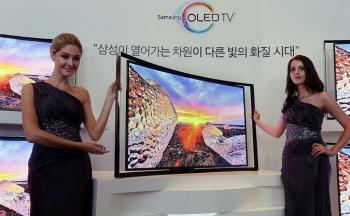 Samsung is also reportedly set to release the curved OLED TV in the US. The original price point was said to be $15,000. It's highly likely that the price will be lower (probably less than $10000). We're still waiting for an official announcement on that one though.